Europa-League: Emenike scores, Ideye, Nosa features while Moses Simon is missing. 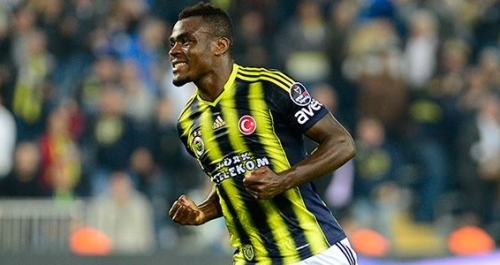 Emmanuel Emenike scored the winner in Fenerbahce 1-0 win over Feyenoord. games are getting hotter by the day. some of them made their team’s line-up on the special night of football. these Nigerian players as their performance speaks loud than voice. club sides across Europe in the ongoing season. the top of the group. visiting Dutch side Feyenoord 1-0.
lasted the distance as his side lost 0-1 to visiting Cyprus side Apoel Nicosia. to host (Ireland giants) side Dundalk FC. new signing Fred Friday lasted the distance as they lost 5-0 to host Zenith St.
minute of the game as his Genk FC side defeated visiting side Sassuolo 3-1.
of the match in their 2-0 home win over visiting Turkish side Konyaspor FC. Slovan Liberec as they lost 1-2 to visiting side PAOK Thessaloniki FC.